I never read Norman Lindsay's famous book, The Magic Pudding, until until I was an adult so I have no idea if I'd have liked it when I was a kid. 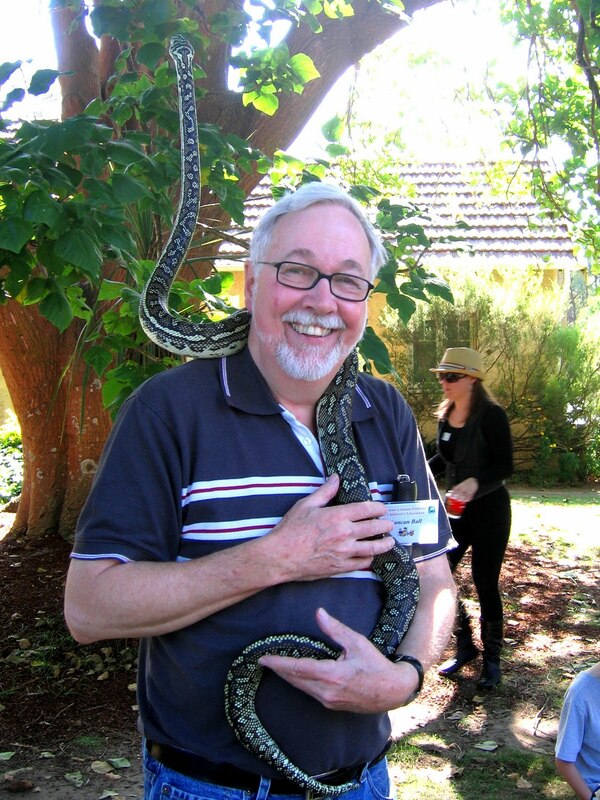 But I'm grateful to Norman---who was a writer, illustrator, painter, sculptor and newspaper and magazine cartoonist---for writing the book because without it there wouldn't be a Norman Lindsay Children's Literature Festival. 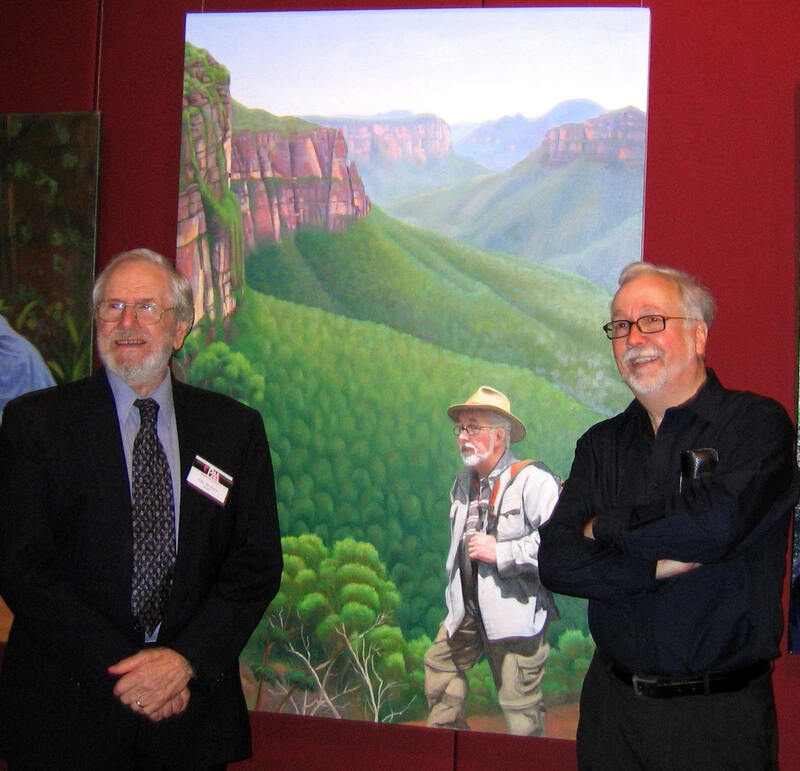 The festival is held every year at his home at Faulconbridge in the Blue Mountains west of Sydney and is now the Norman Lindsay Gallery & Museum which is run by the National Trust. This year I was invited, as was "Cartoon Dave" Hackett, writer Frances Watts and illustrator David Legge. Frances and David did their own special pirate song and dance number while talking about their new picture book, Captain Crabclaw's Crew. During a break between my talks, I got to handle "Princess", a diamond python. I didn't realise it when the photo was being taken but Princess was more interested in a branch of the tree above me than in me. Fortunately, her handler managed to unwind her and get her back down. Authors' lives are not the most exciting lives. In my case, I spend a lot of time at my desk either writing or answering emails or just doing all the many non-writing things that have to be done. In the days before I finished writing Selby Sprung I realised that for three days I hadn't set foot outside my house. But the last week I got out and about. On Tuesday I went to the opening of The Face of Australia, a portrait showby members of Portrait Artists Australia. the portrait that Jules Sevelson did of me is in the show and it was the first time I'd seen the completed painting. He did a wonderful job. If you're in Sydney you can see the show at NSW Parliament House. It's on from Monday to Saturday 9am to 5pm until April 29th---and it's free. It would be a good time not only to see all the paintings in this show but to tour this lovely old building. Last wednesday I was invited to speak at the Newington College Literature Festival . I had an audience not only of Newington boys but boys and girls from other schools. It was a lot of fun. Festivals are a great time to talk to kids but also to catch up with other authors and illustrators. There's a charitable organisation in Australia and New Zealand called Books in Homes. Their mission it is to give away new books to kids who might not have any books of their own in order to promote the love of reading and to improve kids' literacy skills. 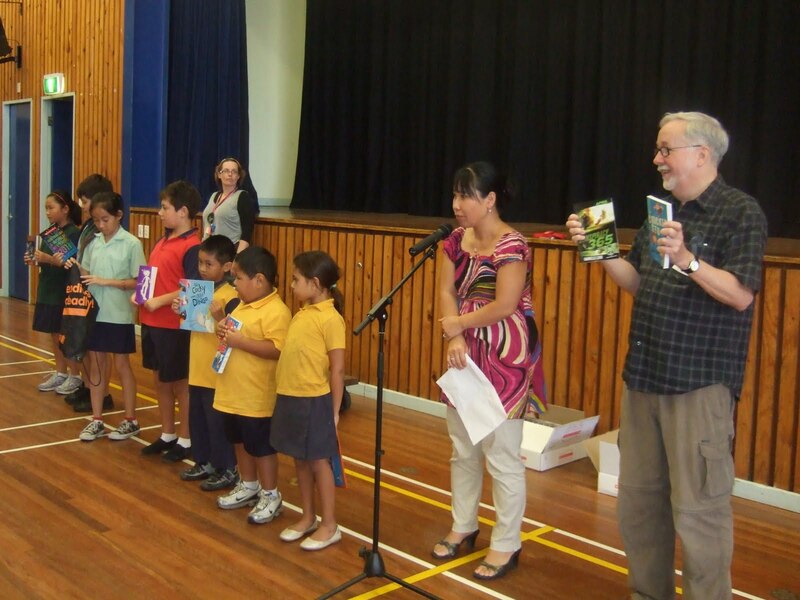 Publishers donate books to Books in Homes and the books are then given to the kids at a presentation ceremony with the help of a "Role Model". I'm a Books in Homes Role Model so I am sometimes asked to visit a school and to help give out the books. Recently I was at Alexandia Park Community School in Sydney where we gave away boxes and boxes of books. Here's a photo of me with, Ms Young, the wonderful librarian at the school and a few of the kids holding some of the books they were given.